I’ve started to learn Android development reading their documentation and getting interested in the possibilities of the programming interface. But I’m not a Java guy. I dislike it, mainly because I come from a more simpler background such as web development, where you can simply write a couple of lines of code and refresh your browser to get started doing something. That said, web development can be very complex, but debugging and testing is quite easy and straight forward to some point. So although I will teach myself how to develop in Android, first of all I will play a little bit doing some fast sketches in Processing for Android, and I will try to do my first project: A simple screensaver. If you are working in Linux like me, I’m on Xubuntu, you should setup things a bit before connecting to your android device. So here I list the pre-requisites. Download and install the Android SDK from here. Instead of the default “ADT Bundle” link, click “Use an Existing IDE” toward the bottom of the page, and then click the “Download the SDK Tools” button. At the right is an image of what it looks like on Windows (current as of December 2012). If any of the items above are missing from the list, use the checkboxes next to “Show” at the bottom of the window. I use 64 bits Ubuntu and didn't need to do this, so there is a big chance that ia32-libs is already installed in your system. More about platform-specific issues can be found in the links to Google’s documentation (above). You can install other versions of the Android API as well, but you must include version 10. You can’t install API 13 or 14 or 17 just because it’s newer. Also note that these revisions are for the individual “SDK Platforms” (which refer to Android OS versions), which is different from the revision numbers (see the Rev. 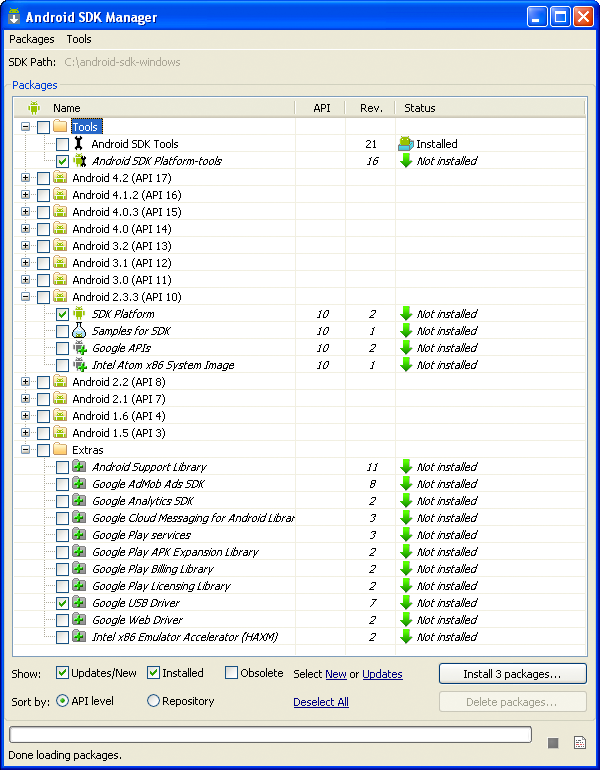 column in the GUI) on the “Android SDK Tools” mentioned above. Confusing? Yes. To build for Android, select “Android” from the drop-down box in the toolbar (by default it reads “Standard”). This places the current editor window into Android mode. To show you that you’ve now entered a new world, the window will also get a lot more green. Run in Emulator – preprocess the current sketch, create an Android project, and run (debug) it in the Android emulator. Run on Device – the same as Run, but run on a device (phone) that’s attached by USB. //variables that describe attributes of the particle. y_speed += .1;//this makes it behave like gravity.